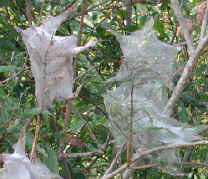 The branch of this choke cherry tree is covered with tent caterpillar "tents" which the young caterpillars spin for their protection and where they retreat when they are not feeding. The eastern tent caterpillar prefers cherry trees and related plants. 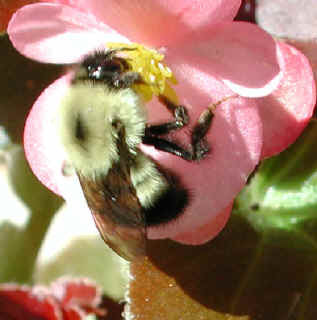 However, we have seen them on ornamental flowering plum and crab apple trees, too. 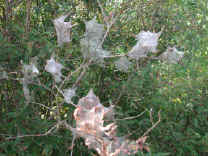 This is a closer view of a few of the eastern tent caterpillar's "tents". Note the caterpillar activity in the upper portion of the right "tent", and the stripped leaves on the tree, specifically the leaf to the left of the lower portion of the upper left "tent". 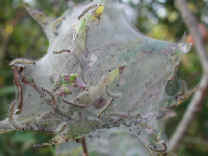 This is another close up view of one of the eastern tent caterpillar's "tents", which has considerable activity both on the inside and on the outside of the "tent". The black dots are their feces. These eastern tent caterpillars ranged in size from about 1/2 - 3/4 inch in length, but more mature ones can grow larger. The color contrast in this photo also gives us a good view of the length of the projecting hairs, which are over one half the length of the caterpillar's body. This photo gives us another view of the differences in size of the eastern tent caterpillars in this "tent", the largest being in the lower left and the smallest being in the center. We can also get a better view of the caterpillar's feces (black particles), which we know everyone is interested in seeing (:-)). It is probably more interesting to note the aft end of the caterpillar in the lower right of the photo, whose markings make it look like it has two eyes. The head of the eastern tent caterpillar is black, as is the one in the lower left. 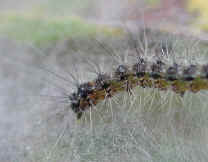 This is another view of some of the smaller eastern tent caterpillars in and upon the "tent"
In this photo of the eastern tent caterpillar, we have a close-up look of the light and dark hairs projecting from the caterpillar's body, and at the bottom of the photo we can see the strands of silk which form the "tent". This eastern tent caterpillar has just made a left turn to give us a good look at three of its legs (the three segments just behind the head). The hairs projecting up from the bottom of the photo are from another caterpillar.